I heard about Amazon Mechanical Turk (or MTurk for short) a couple of years ago but after registering and scrolling through the jobs offered (aka HITs or Human Intelligence Tasks) I decided that the pay is just too low to even consider it. Then recently, I was reminded of it and after reading for a while on various blogs and forums, I logged in once again. This time I had a mission. I wanted to see how much money a normal person can make. Every new worker on MTurk wants to know how much they can expect to make in their first month and be assured that they are doing it right. So before I began I searched online for an estimate for my expected earnings in the first month as a new worker. I found articles written by professional writers hired to spend an hour or at most a day on MTurk and then proclaim that, yes, the pay is low, but you can make $7.25 or even $12 an hour. I also found people’s posts on discussion boards claiming that they make about $800 a month turking 10 – 12 hours a day. And then there were the frustrated posts of people that could only make $2 an hour and that in a good hour. Many people were sharing that they make about $10, $15, or $20 a day but were not discussing how much time they were actually working for these amounts. A month later I had the answer: about $480. And here are the earnings per day. How long did I work each day? You can see that some days I made more than $20, some days way less than $10. Every day I started working around 8:30 a.m. and stopped around 10:00 p.m. I did not sit at the computer all this time (13 and half hours) – I did my house cleaning in between HITs, I picked my child from school, or I went grocery shopping. On the days when I was out of the house for longer periods I could not make even $10. There were also plenty of days when I worked most of this time and still did not quite get to $20. What HITs did I do? From the beginning I searched for HITs that pay at least $1 and the ones available to me were mostly surveys. There were also a few lengthy transcription HITs paying a bit over a dollar and occasional ones that required some writing. I started doing surveys, one after another. I read that they are among the highest paying HITs on MTurk so it made sense. I took a writing HIT once but forgot to check the number of words before submitting and it was rejected for having too few words (I had 196 and it required minimum 200). I did not dare to take another writing HIT for fear of rejection and because it takes too long for me to write. I also think that the average person will not have the ability to write fast and well, so the average person is likely to do what I did: take surveys. I also did a number of short transcription HITs from crowdsurf. They were fun and being only 10 – 35 seconds long made them ideal for racking up the HIT numbers. Other than that they were paying only cents and were taking me about 3 – 5 minutes each so doing those is worth only for making more HITs quickly. They were being approved within 5 – 10 minutes as well. Two other types of low paying HITs that were easy and good for raising my approved HITs numbers were those by tagasauris and redwood (also transcriptions of 10 s). I never did too many of those HITs, though, fearing a mass rejection. I read that when people pass certain approved HITs thresholds they start doing better. The most notable threshold mentioned is 1000 approved HITs. 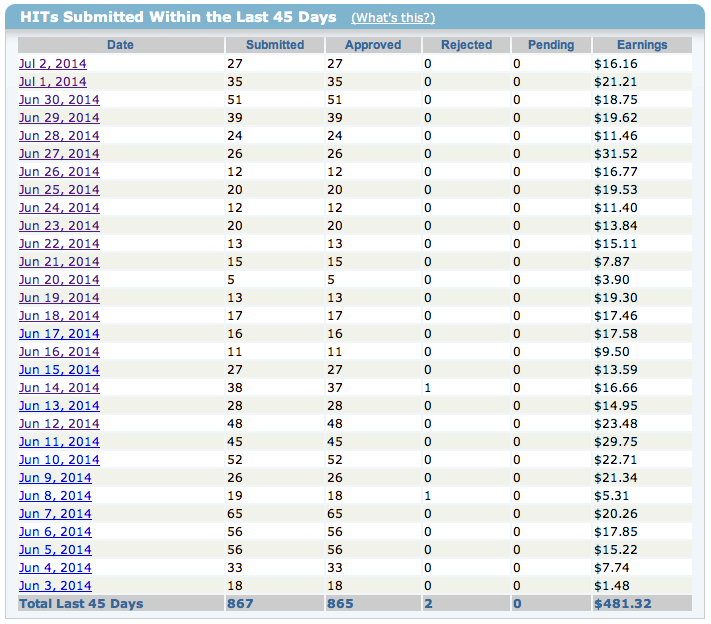 I am still a bit shy of this number (865 so far) but after passing 500 I started noticing more $2 surveys available. It could have been just a coincidence though. I plan on going over 1000 HITs to see if it will make any difference. When there were no more surveys for $1 (or more) I would open a new browser tab and lower the threshold there to $0.50. I had to constantly refresh the page with the $1 threshold to see if a new survey appeared. The dollar and two ones were flying off the shelf in seconds so if you are not quick to grab them they are gone before your eyes. I was also checking the reddit thread HWTF (HITs Worth Turking For) for well paying HITs. What is published there are almost exclusively links to surveys because one can take them only once and it does not cost sharing the info. Keep in mind that a lot of the surveys require that you are a US resident and at least 18 years old (which I am). For people in other countries the available surveys may not be so numerous. So all told I did mostly surveys on MTurk and made about $480 working every single day for a month, doing it during every free minute I had and often working long hours without a break. Physically speaking it sucked. I had pain in my neck and shoulders and my hands were getting numb to the point that I became worried and tried to scale back a bit. I suffered a lot for these $480 bucks and I can tell you that it was not worth it. Halfway through it I decided that I am going to write an article about this modern sweatshop to give other people a realistic picture about MTurk. And that motivated me to finish the month. Right now I am taking a break before the final effort to get over the 1000 HITs and report if that made any difference. Are there people that make more than $500 a month from MTurk? Just keep in mind that the information was self-reported and collected through a survey on MTurk. If you believe that the survey takers answered honestly the answer to the above question is affirmative. There are small number of people that make between $100 and $200 a week, i.e. between $400 and $800 a month. How do some people make more than $500 a month from MTurk? After reading a lot of people’s comments on various discussion boards I conclude that the occasional lucky ones who earn that much can do it for particular type of work, namely writing and transcription. If you search through the HITs without checking “for which you are qualified” that pay at least $1 you will see that there are better paying HITs for writing articles. Unfortunately, the majority of those HITs are by only one requester (CrowdSource) and they require certain writer qualifications. CrowdSource happens to have plenty of those qualifications already granted and new people are unlikely to get one. Maybe some semi-professional writers can pull off $800 a month if they have these qualifications but they are not going to be representative of an average turker. There are also many transcription HITs available but unless you have done transcription and have transcription software those are unlikely to be well paying for you. The good thing about transcription HITs is that they are either available to anyone or if not, they require a qualification test which can be taken by anyone. 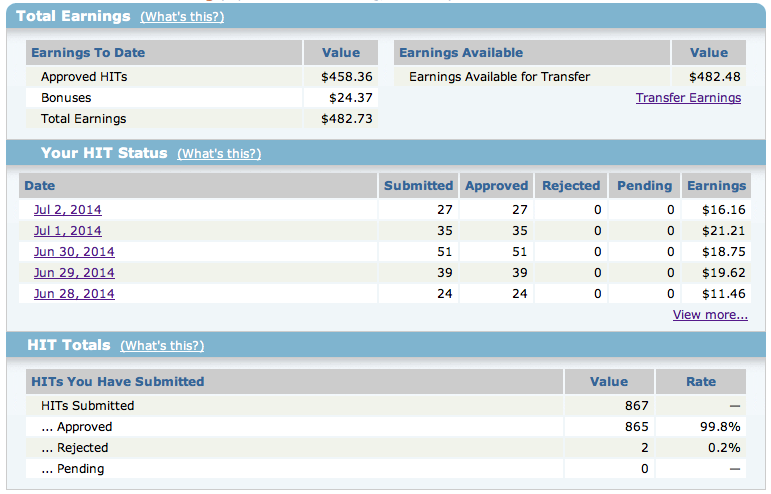 I do not think that an average person can make worthy amount of money through MTurk working full (and more) time. Not unless they can write fast and receive the coveted writer’s qualifications or they can transcribe professionally. But that puts them in a category above the average turker. If you didn’t get cold feet reading so far, I can suggest that you try MTurk for a period of time as a tool for earning a set amount of money. People that casually turk seem to be the ones most happy with it. They do not physically suffer and by doing surveys here and there while watching TV (or even while at work) they collect pocket money little by little. The right attitude is to regard MTurk not as a source of income but as a source of extra money for luxuries that you don’t need any time soon. Many people mention that MTurk is helping them fund the Christmas season or buy a somewhat expensive gift for themselves. I suggest that you start more intensely for a week or two to get a feel of when the well paying surveys are posted (I noticed that often there is nothing before 9 a.m. EST but some time after that the researchers come to work and post; there are also the end-of-the-workday types that post their surveys after 9 p.m. EST; other surveys are posted throughout the day). If there is nothing when you search just continue checking until you get a good catch. If I decided to turk casually, I would set a goal of $3 a day. That is 2 or 3 surveys a day for a total of 1 hour working time. If done every day it will amount to $3 x 30 = $90 a month. Not much but after a year I would be able to go on a vacation somewhere with that $1000. Good luck with Amazon Mechanical Turk and don’t overwork yourself! UPDATE: I did go over 1000 HITs the next month but unfortunately there wasn’t much in a way of better paying HITs. I obviously had access to those HITs that required the turker to have at least 1000 HITs. I am not sure if this increased the amount of HITs paying $1 or $2 available to me because some HITs are actually requiring workers to have completed less than 1000 HITs. These limits are typically set by researches who don’t want their surveys to be filled by serial survey fillers. Also, there wasn’t any rainfall of $5 HITs as I hoped. Not even one. Requesters don’t want to pay too much on Amazon Mechanical Turk and HITs paying $1 or $2 are pretty much the highest paying ones most workers will do on a regular basis. Having more HITs under your belt may marginally increase the amount of $1 or $2 HITs available to you (if we assume that most researchers will not be adept enough to set the 1000 HITs limit). Just don’t expect large increase in your abysmal hourly pay when you get over the 1000 HITs bar.